Dream Big & Buy The Shoes: Is Writing for Blogs Dead? 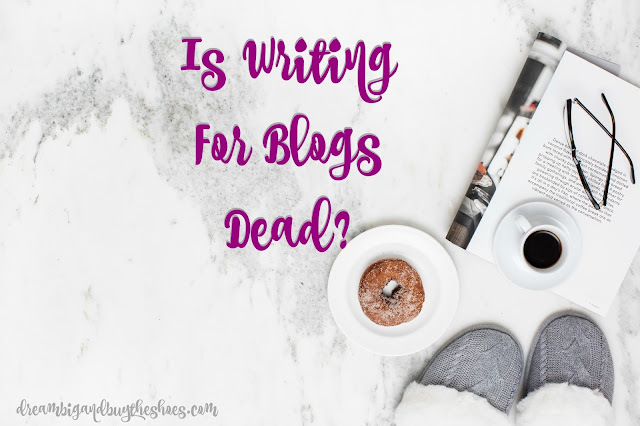 Is Writing for Blogs Dead? I was so disappointed when I realized what I was reading. One of my favorite shop owners and curated blog writers said that no one really writes anymore. Unfortunately, she's wrong. I don't typically like to call people out like this, but she's very wrong. She went on and on about how there are only influencers now, and if you have a blog you should only be sharing pictures- because that's all people care about. This curated blogger went on to say that weekend recaps were old news, and the only writing being done is when you want to be featured in the Huffington Post. I have over 20 examples of how she's incorrect because I read the same blogs every week of my peers, my friends and inspirational people who share more than just pictures. They share their weight gain struggles, they share about their pets and unfortunate things they are dealing with, they share their life victories, their new houses, and they share their lives with us. Sometimes it is hard to just say what's on your mind or get things off your chest. I know that I often have thoughts that I don't always know how to convey articulately on this piece of my the Internet, so I keep them to myself. So you'll get a post on my new favorite recipe instead, and you know what...that's just fine too. You see, I love reading about what's in your bag, or the newest mascara you purchased and loved, or tips on packing only one bag to take on your next trip. I think we all have something to share- some of us have interests in a wide variety of topics and that's really amazing that a number of blogs can entertain us. I love reading about your weekend- because maybe you shared a restaurant where you live, or something you struggled with and I relate to. Your words speak to me and some posts have literally helped me get through some big life changes- like finding out we were expecting a baby and stressing because we lived in a two bedroom townhouse. Your words helped me realize that all a baby needs is love--and yes, we did end up moving in to a larger home but during that time YOUR WORDS helped me get through. Writing for blogs is definitely not dead, I actually think blogging is booming. Women who stayed home with their children have given themselves a bigger purpose, we are learning coding and photography, and we are part of a community of people who understand one another in some special way. What are your thoughts on blogging? I would love to hear what you think.